It’s time to announce the winners of the coveted 2017 #CityHallSelfie awards! These 23 winners showcase the best of the best from #CityHallSelfie day on August 15, 2017. Don’t forget to submit your nominations (and later, vote for) the granddaddy of all #CityHallSelfie awards – the Member’s Choice award. Individual award winners receive a trophy and selfie stick from ELGL and our #CityHallSelfie day partner Bang the Table. And, here’s a map of all of the #CityHallSelfie tweets received in the 24 hour #CityHallSelfie day period – you can see from the sheer volume of submissions, that these 23 winners are in a league of their own. Don’t forget – if you liked #CityHallSelfie day – you’ll love ELGL membership. Sign up today for exclusive access to local government job resources, unlimited job postings (for our All-In members), priority registration at our conferences and webinars, and a community of local gov friends who love local government as much as you do. Membership is $15/students, $30/individuals, and $300 for All-In (organization) members. Why they won: population-based awards are pretty straight forward, but we couldn’t help but be impressed with the truck, the smile, the focus, the hashtags… so this #CityHallSelfie was a clear winner from the second-largest city in America! Why he won: again, it’s a population based award, but we’d be remiss if we didn’t note that PSH is one of ELGL’s favorite friends. He’s one of the most connected people in local government. He never shies away from the chance to make a new friend or connection. And, he’s done some great writing for ELGL on his experience as an openly gay local government manager, and how to maximize experiences at large local gov conferences. Bravo, Phil! Why they won: it’s the entire cast and crew of Law and Order: Special Victim’s Unit. ‘Nuff said. Why they won: we’re not sure who’s a citizen and who’s a city employee, but regardless… the fact that there are citizens who love their city so much they’re willing to lie on the ground and spell out the city name with their bodies… this is such a testament to what #CityHallSelfie day is and the pride we hope it instills in a community. Why she won: Abby accurately tagged @ELGLSconnie, the go-to account for all things local gov in Wisconsin. Plus, she seems genuinely pleased to be in the #CityHallSelfie, which is always an indicator of a great local government journalist who wants to be at city hall, sharing information about the awesomeness of local services. Why they won: the city of Battle Creek shared a lot of great #CityHallSelfies on August 15, 2017, and then they quickly turned around and shared the story of their exciting day in a wrap up video. It was the perfect end to a great day celebrating the city of Battle Creek. Why he won: this was one of 14 stops that Tony Reed and his Mt. Angel team made around small towns in Oregon. While his beard was prominent in each #CityHallSelfie, he wins for taking this #CityHallSelfie through his beard. Why they won: our local gov nerd is showing… the best accessory for any outfit is a budget book. Plus, we love their call for input and feedback – participatory budgeting is also a great look. Why she won: this was just one of nine #CityHallSelfies that Ember posted wearing a cute hat. Why they won: Thanks to the Georgia Municipal Association’s stellar advance work, 132 Georgia cities were represented and/or participated in #CityHallSelfie day. To spread the word, GMA used social media, email campaigns and in-person visits to cities across the state. Emails included detailed instructions for cities to share on their official social media channels or send to GMA to share on their account. Why they won: in addition to a lot of great tweets and grams leading up to #CityHallSelfie day, CitySourced also published a great guide about taking the perfect #CityHallSelfie. Why they won: one of the #CityHallSelfie media team members said they “almost choked on their coffee” when they saw this epic #CityHallSelfie post. You have to appreciate a city that loves their manager this much! Why they won: three words – Mr. Fuzzy Britches. Also, the looks on the police officers’ faces makes this picture the funniest #CityHallSelfie of the day. Well done, Ocean City. Why she won: we saw a lot of beautiful, historic city halls on #CityHallSelfie day but Becky wins the award for her selfie in front of this Italian site with an estimated construction date of 7 B.C. Why they won: we loved this #CityHallSelfie because it showcased a beautiful city park, and included so many smiling and happy community members. #CityHallSelfie day is all about showing community pride and you can feel that pride oozing out of this photo. Why she won: where do we begin? Sarah blew the previous #CityHallSelfie day record of 13 out of the water. She added #BigLocalGovBaller to her Twitter caption and we couldn’t agree more. 50 #CityHallSelfies in one day showcased the St. Louis region and the government entities, big and small, in that part of the country. Why they won: at last count, we mapped 208 #CityHallSelfies in Maryland! This is due, in large part, to a wonderfully coordinated effort by the Maryland Municipal League. 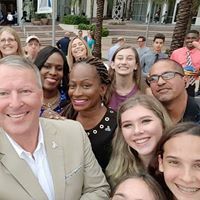 The League shared information about #CityHallSelfie day with their member cities, and continued to share #CityHallSelfies throughout the big day. Why they won: we had to give away two awards in this category, because we were so impressed with Chapel Hill’s ASL #CityHallSelfie, and Milford’s Parks & Rec showcase. Congrats to both cities for putting so much creativity into the big day – both #CityHallSelfies reflect beautifully on your communities! Why they won: this #CityHallSelfie has it all: community pride, recognition of a major community event, a mythical forest creature. Congrats to the City of Issaquah for taking the best #CityHallSelfie of the day! Don’t forget to submit your nominations (and later, vote for) the granddaddy of all #CityHallSelfie awards – the Member’s Choice award. Individual award winners receive a trophy and selfie stick from ELGL and our #CityHallSelfie day partner Bang the Table.